Canadian Northern Shrimp Industry | Newfound Resources Ltd.
We are often asked why we cannot supply a given size or product form year round. While we strive to match product availability with customer needs we must also deal with a complex but well managed Canadian system of individual quotas and a wide array of nature’s constraints. 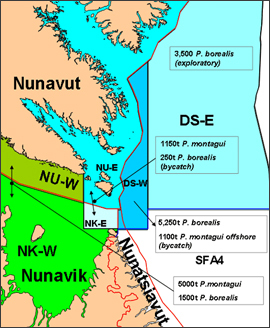 Our annual quotas are sub-divided into 7 traditional areas plus a new set of 4 quota areas in Ungava bay ( see map ), all with their own individual quotas or enterprise allocations ( EA’s) . Within these 11 areas are different rules and quotas for pandalus borealis versus pandalus montagui. 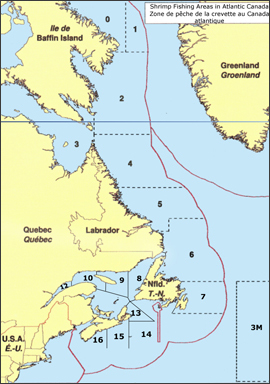 Each area also has its own unique attributes ranging from different sizes to different seasonal catch rates to varying weather patterns and of course those challenging ice conditions that close certain areas for up to 6 months of the year. Complex ? Sure is ….but just let us know your requirements and our captain and crew will try their best to deliver a product that meets your needs.